I just finished reading this book. Its title caught my eye along with colour of the cover, yellow, it seems like the boys (drawings in the middle) are burning inside fire, but then you see one of them with a white sac and the other in the middle with a red short. That was the first thing that drew my attention, and then I read critics and praises and I said to myself this book is a must read. My third non-fiction book I have read about war in the African continent, the first one is A Long Way Gone by Ishmael Beah, second My father, Maker of the trees by Eric they are absolutely 3 different book written from different perspectives and 3 different countries of Africa; west, east and south. "They Poures Fire on US From the Sky" is a page turner, I love it, an easy read. 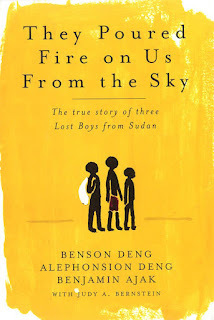 In this Non-fiction novel 3 family members tell the story of how they survived the war that erupted in Sudan in 1987 when they were only between the tender ages of 5 and 7 years old. They narrated how their lives were before the war (it was an amazing simple life), how the war took them by surprise, how they suffered from hunger, thirsty and always on the point of losing their lives wandering from one place to another in search of a safe refugee camp and ended up turning into The Lost Boys of Sudan. Luckily, the government of the USA relocated a lot of them to the United States of America in order for them to have a better life. This book gave me an insight into Sudan's state of politics and history. 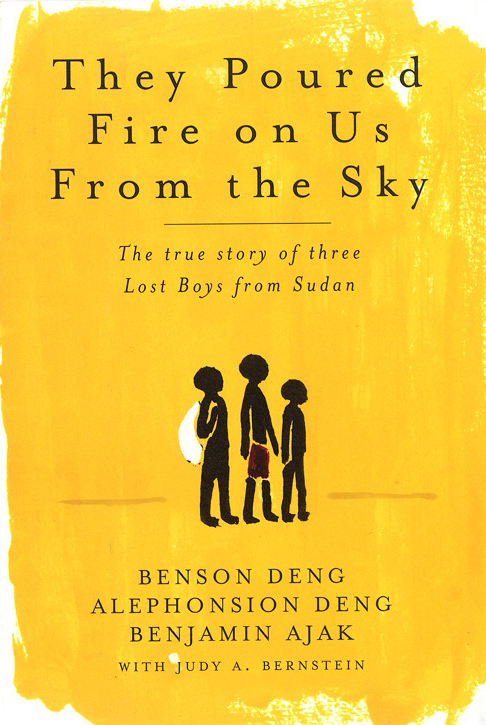 It also made me aware of the lost boys of Sudan and how hard life in refugee camp could be, and what it would feel like to be a refugee, how important it is to be together in moments of perseverance. Yes, I recommend you to read this book. It is crazy how often colour of books do appeal to me. I have read a few non-fiction books though I am about to change that. I loved your summary of this book. I know I will get to it one day. All best, Mary. Cheers! Geosi, thanks for the comments. I think apart from being a good writer you also need a good marketing director to help you attract readers, there comes their work with colours, pictures... etc.. But we shouldn't judge a book only by its cover but by its content.. LOL (I know everything in life is like that though, you get attracted first with what you see. If you get to read it, you will enjoy it. I contacted Judy Bernstein from the little we emailed I just discovered she is such an amazing humble person. You should read the book. The book cover is the first thing that attracted me to this. It sounds interesting per your review. I've put it on my Amazon list. Thanks Mary.